Today, the European Space Agency is celebrating 10 years of its Large Diameter Centrifuge with a Hypergravity Workshop. The LDC offers experiments in hypergravity: the 8m-dimameter four-arm centrifuge is set spinning at up to 67 revs a minute, creating up to 20 times normal Earth gravity. Experiments in microgravity, on board the ISS for example, allow us to explore the effects of living and coping in an environment without gravity. But to understand these effects properly, it is useful to same responses in different gravitational conditions such as partial gravity (on the Moon) and hypergravity. 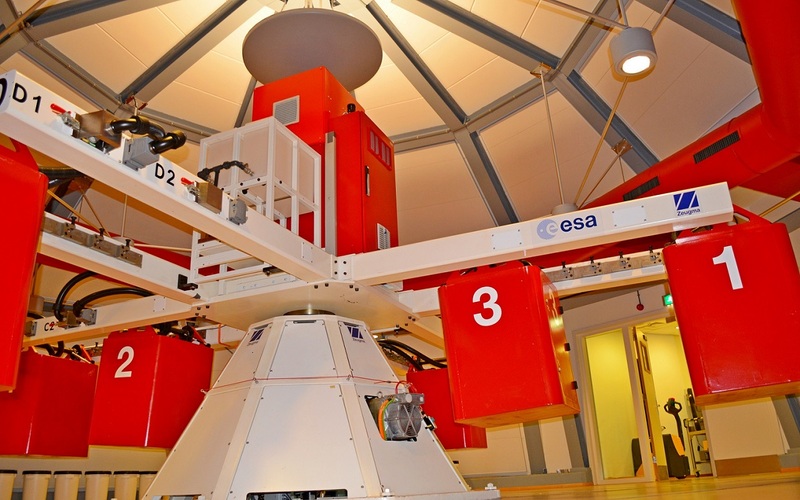 ESA built its LDC to improve the research infrastructure it could offer the European research community, encouraged by the European Low Gravity Research Association and supported by Dutch government. It is located at the ESA’s Life and Physical Sciences Instrumentation Laboratory in the Netherlands. Poster image courtesy of ESA.